Welcome to the A-to-Z of Yeovil's History website. This is a work in progress, unfunded and updated almost daily, to record much of the history of Yeovil, Somerset, England (before about 1970). It uses internet technology to embed links within each page to enable the reader to follow an infinite number of threads to suit their interest. Viewed in 124 countries with over 2,123,400 page views, this website currently contains more than 2,230 pages and over 9,950 images. The 'Themes' in the various navigation bars gather pages into themes while the 'A-to-Z' links lead to listing pages starting with each respective letter, plus some special features that are only accessed from this page - I'm sure you'll soon get the idea. Discover more than 330 personalities who made Yeovil the town it is today. Streets, courts, yards, buildings, etc. If it was in Yeovil it's probably here. Earning a crust - commerce and industry in Yeovil. Sports, events, celebrations, and so forth in Yeovil. The shops and shop keepers of yesteryear. Yeovil's and Yeovilians' response to war. Learning in Yeovil from Dame schools onwards. The mainstay industries of Yeovil for centuries. Compare the changes to Yeovil over time. 90+ photos - are you on any? Where was your house built? Also included in this website, separate from the A-to-Z listings, is a series of essays outlining the History of Yeovil through time. 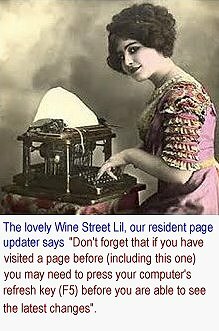 Click here to read..
Below are listed (roughly in the order I do them) the pages added or with interesting updates in the past two or three weeks, with links. Away for a couple of days. Every attempt has been made to seek permission for copyright material used in this website. However, if I have inadvertently used copyright material without permission / acknowledgement I apologise and will make the necessary correction at the first opportunity. but please NOT those images credited to others. Please mention yeovilhistory.info as the source. bottom of the page - these numbers are totalled weekly and shown above the 'Photo of the Week' on this page. Please note that this counter only allows 120 flags, but to date this website has had visitors from 124 countries.